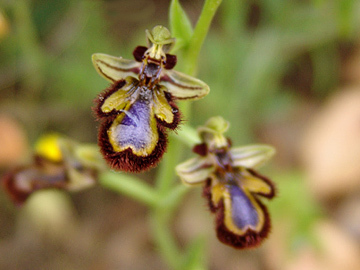 bee orchids (genus ophrys) are specialized orchids from the mediterranean, which basically exploit horny bees. instead of producing nectar to attract pollinating insects, ophrys flowers show morphological adaptations (including hair!) which make them resemble their pollinators, both in the visible light and ultraviolet spectrum. in addition, they also produce pheromones which further attract the males of their pollinator species. when, for example, a male bee is successfully decepted, it will land on the flower and attempt to copulate with it. during this so-called pseudocopulation, pollen will get stuck to its abdomen and/or head. this way, the pollen has a better chance of reaching a flower of the same species, rather than just any flower. if you’ve become curious, wikipedia (german version) has some more information.